Alexandra Hammond proposes “radical maintenance”, or the rigorous use of trash (both physical and ideological) as a wellspring of artistic production and a [dangerously] utopic approach to contemporary life. In Woodland, California, the blue-collar corollary to the neighboring University town where I grew up, there is an establishment called Thrift Store Outlet. Located in a ‘70’s era strip mall on West Main Street. Long after the few blocks of turn-of-the century downtown buildings have given way to acreage of parking lots and low-slung big box retail interspersed with Jalisco-style taquerias and auto-body shops, before the towering rice mills at the edge of the big row-crop farms, the store occupies what must have been an old supermarket. Fluorescent lighting, off-white linoleum floors, and aisle after aisle of clothing, linens, china, housewares, board games, furniture and picture frames. This is not your curated urban “vintage” shop, nor does it carry the rusted farm equipment, barn-siding or claw-foot bathtubs of the antique mall or the salvage building supply. Instead, Thrift Store Outlet is the intermediary catchall, the place where normal household objects and garments end up without judgment of their relative age (too new to be antique, to old to be new), rarity or retro aesthetic value. Boost the color and the place could be the subject of an Andres Gursky photograph. I have shopped at Thrift Store Outlet since my high school years, and found treasures on its racks, many priced less than a dollar. I have often stood in wonder before this wealth of disused things, knowing that nearly every town in America has stores like these. They are refugee camps for the junk in the shed, the stuff that doesn’t make the cut in the move from the house to the apartment, the clothes that kids have grown out of or that grown ups have fattened out of. I have no way to measure or categorize the quantities of stuff in relation to global wealth, population, or the growing middle classes in China and India, but it seems that, excluding personal computing devices (which represent a whole other waste stream swelled by planned obscelecence and intentionally incompatible operating systems and power cords) there would be no need to make or buy anything new ever again. One could live comfortably, even stylishly, off the “fat of the land” of our wealthy, commodity-driven industrialized society. Plates made in 1967 work the same as those on sale at Crate and Barrel today, as do tables and chairs, bedclothes, jeans and suitcases. Likewise, household appliances can last for decades, possibly generations, with proper maintenance and repairs. Liberal thinking of the past 200 years, especially since the second half of the 20th Century has been dedicated to expanding of the privileges of Humanity. Women’s movements, race-equality movements, postcolonial movements, and human rights movements have made progress in expanding full human status regardless of race, gender, sexual orientation, religion or age. A diversity of humans have increasingly left the category of things (Others) and begun to exercise the full rights of the rational human subject within liberal society. Still, these projects of social justice are far from complete, and the benefits of inalienable human rights, not to mention the distribution of wealth and education needed to enact them, are bestowed upon relatively few of the 7 billion of us alive on the planet today. It hazards blasphemy to suggest that this obsession with “humanity” or even living things, may offer an incomplete version of the justice and equality we claim to seek. But because the material world does so much to shape the world of ideas, I wonder what happens if we care for objects as we claim to care for humans. Here, I expect protesting anecdotes about the cruelty of materialism: the cranky neighbor who poisoned a boy’s cat because it clawed at the lid of his convertible Cadillac; the human and environmental cost of blood diamonds; how the existential rage of American Psycho’s fictional Patrick Bateman is stoked by the superior print quality of a rival executive’s business cards. The above are allegories, you say, for the need to relinquish objects, to teach love and empathy, to understand once and for all, that ideals are more important than matter. But what happens if we do put things on equal footing? What if these tales lead us away from continual denial of the real weight of material things? I would argue that these stories illustrate how objects already live for us, how they are symbols, vessels and agents against which we construct our sense of being in the world. Instead of ignoring them, giving them either second-class importance or shamefully fetishizing them behind closed doors while claiming to like people or animals (even redwood trees) better, why not admit what they mean to us and start treating them accordingly? Perhaps this would lead us to better outcomes for living beings, also. The doctrine of Modernism celebrates the new, attempting to always replace all that is and all that has been done. This process of sublimation applies to ideologies as well as to cars and appliances, pretending that either can be swept away or replaced without consequences (lingering psychic and social structures, the overflowing of landfills and the leaching of toxins into the groundwater). 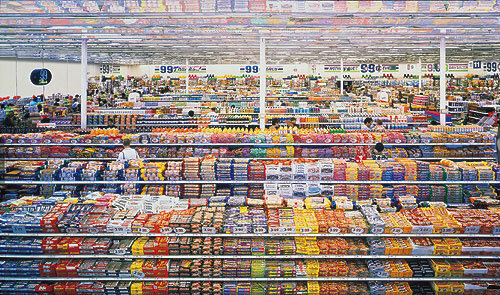 Extending the metaphor of trash and throwing away, Postmodernism can be seen as a realization that there is no “away”. Instead, we live within shifting sediments of ideas and material things, layers of past, present and imagined futures. We surf the web and send tweets from old buildings with barely enough electrical outlets to charge our devices. From this point of view, I propose a stance of radical maintenance, the position of caring for and relating to objects as actors and receptacles of contemporary being, inscribed with networks of human labor, genealogies of material, signs of trauma and ware, possibilities for healing and redemption. I am not a Luddite, and this proposition does not have to do with nostalgia for William Morris’ forgotten days when craft and the expression of the human hand was equated with wholesome autonomy. Instead, I wonder what would happen if each iPhone assembled at Foxconn was treated with equal care as an adoptive child. How might this change the relation between the end “consumer” and the team of workers who designed and developed the device, the miners who extracted the ore for its raw materials, the workers who fabricated it and the arrangement of the assembly line where it was put together? The Dutch design collective Platform21 addresses the potential of radical maintenance through their project Platform21 = Repairing. In their Repair Manifesto, Platform21 debunks the popularly invoked dichotomy between enjoying the pleasure and utility offered by material goods and mindful conservation. Their first principle states, “Repairing isn’t anti-consumption. It’s anti-needlessly throwing things away.” Their Repairing movement calls on manufacturers and end users to take new and potentially productive attitudes, stating that products should be designed and built to be repairable and that consumers should empower themselves as fixers, hackers and innovators. The Repair Manifesto outlines how this humble activity has the potential to dramatically shift and flatten relations of labor, production and consumption. In population centers of the Global North, where most objects we buy for everyday use were made and assembled far away, traversing complex networks from raw material to machined part, to assembly, it is hard to fathom the fact that each component of the things we use is made by someone. In spite of the supposed coming of the 3rd Industrial Revolution where drones and 3D printers are predicted to reinstate cottage industry and redistribute the means of production jeans and t-shirts are still sewn together by humans pushing fabric through sewing machines (sometimes in homes, sometimes in factories). Likewise, the tiny screws that fasten the aluminum casing that protects the brain and nervous system of my MacBook were spun into place by the fingers of a worker in China. Many of the products we purchase and interact with most intensively are integrated into our bodies. Food and drink comprise an estimated 11% of the typical American household budget (a low figure by world standards) and their very intimate role in our daily routines and long-term health is worth considering when speaking of influence of objects on humans. In the summer of 2006, I visited a coconut processing facility just south of Bangkok, Thailand. The open-air building consisted of a metal roof, concrete foundation and half-walls. Seasonal workers, many of them ethnic Hill Tribes people from the North, trimmed the leathery green outer coating of young coconuts, exposing the fibrous white Coir layer that surrounds the hard shell and “water” inside. This by-hand process readies the fruits to be packed in foam coolers and shipped to a variety of retail destinations. The young coconut, only 3 steps away from its raw format (picked, peeled and packed) has been transformed from raw agricultural product to soft drink. Some nuts would be tapped and served to tourists and beachgoers in Thailand, others would be further processed or shrink-wrapped, labeled and shipped to grocery stores for foreign consumption. Each coconut had been skinned by a person, using a sharp machete. Men and women worked together and were paid by the nut in this low-wage seasonal occupation. Working fast paid off. Workers wore light clothing and plastic sandals, no gloves or heavy footwear to protect against the slip of a sharpened machete blade. The flesh, bone and nerve-laden extremities of each coconut chopper were as susceptible to cutting and skinning as the leathery peel of the nut. Each healthy sip of coconut water is inscribed with the working conditions and wages of the person who processed it, not to mention the one who picked it, packed it, drove truck and barge that transported it. Figure 4: (Right) Martha Rosler’s Meta Monumental Garage Sale as staged at MoMA in 2012. 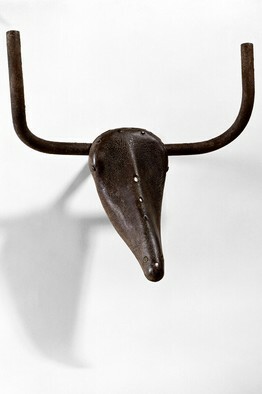 (Left) Pablo Picasso, Bull’s Head from 1942 made from a bike seat and handlebars. Accustomed to the conversation between objects and their assigned values, both ritual and economic, artists have worked to reveal the linkages between objects, the way they effect humans, and the conditions of their manufacture and end use. Martha Rosler’s Meta-Monumental Garage Sale has been staged in various art institutions since it was first shown in San Diego in 1973. A kind of artist-assembled Thrift Store Outlet, the piece invites visitors to sort through and purchase used goods that have been arranged and categorized by Rosler herself. Visitors browse, bargain and buy the objects for sale in face-to-face transactions with the artist. By curating common, second-hand goods for display and direct sale in the museum or gallery, Rosler opens countless questions about the institutional and ideological structures that assign value to things: a used bike vs. Picasso’s Bull’s Head; the way we envision ourselves and our fellow patrons when looking in a museum vs. a yard sale; the proliferation, collection and categorization of stuff within the whited sepulcher of the museum vs. the darkness and disorder of the typical suburban garage. Revital Cohen and Tuurn Van Balen’s project 75-watt (2013) stages the manufacture of an object that resembles a hand-held household appliance, but has no practical function. The object is designed solely in order to choreograph its production and assembly at a factory in China. The resulting Video piece shows workers in different phases of assembly-line production. The movements of the workers reveal how the design of the object being made, and the assembly line itself, structure the way our bodies exist in the world, repeating a series of actions over and over. Though the factory where 75-watt is staged is located in the Pearl River Delta, where many of our “made in China” goods are produced, Van Balen states that the project is less about critiquing working conditions in China than it is about exploring how people are connected across the globe by the objects we buy and use, how these objects, from kettles to digital cameras, are embedded within social and cultural reality from their “birth” on the assembly line to their employment by the end user to their obsolescence and entrance into the massive, and largely mysterious, waste-stream of trash-barges, landfills, recycling centers and ocean garbage patches. In reality, the way we treat objects amounts to the way we treat people. Substitute the word “objects” for animals, environment, watershed, soils, and the equivalence remains. Radical maintenance could be pegged as a new form of animism, or conversely, another flavor of commodity fetish. In part, I would embrace these definitions, but only in as much as they refuse draw hard lines between things and people, subjecting the former to indiscriminate use, punishment and disposal, and therefore relegating those that fall short of full human status to the same fate. Amelia Jones, Body Art/performing the Subject (U of Minnesota Press, 1998). Mikhail Epstein and Aleksandr Genis, Russian Postmodernism: New Perspectives on Post-Soviet Culture (Berghahn Books, 1999). William Morris, News from Nowhere (Routledge, 2012). Evgeny Morozov, “Making It,” The New Yorker, January 6, 2014, http://www.newyorker.com/magazine/2014/01/13/making-it-2. Derek Thompson, “Cheap Eats: How America Spends Money on Food,” The Atlantic, March 8, 2013, http://www.theatlantic.com/business/archive/2013/03/cheap-eats-how-america-spends-money-on-food/273811/. Joseph Conrad, Heart of Darkness (Harper Collins, 2013). Conrad, Joseph. Heart of Darkness. Harper Collins, 2013. Epstein, Mikhail, and Aleksandr Genis. Russian Postmodernism: New Perspectives on Post-Soviet Culture. Berghahn Books, 1999. Jones, Amelia. Body Art/performing the Subject. U of Minnesota Press, 1998. Morozov, Evgeny. “Making It.” The New Yorker, January 6, 2014. http://www.newyorker.com/magazine/2014/01/13/making-it-2. Morris, William. News from Nowhere. Routledge, 2012. Thompson, Derek. “Cheap Eats: How America Spends Money on Food.” The Atlantic, March 8, 2013. http://www.theatlantic.com/business/archive/2013/03/cheap-eats-how-america-spends-money-on-food/273811/.